Think of the RADX as an extension cord. 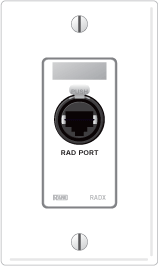 The port to which the RADX is connected needs to be configured for a specific kind of RAD – and you can only plug in that type of RAD. People might choose the RADX approach over buying all the specific RADs because of the cost. A RADX is much cheaper than an actual RAD. Therefore, just buying one set of RADs and moving them around on an A/V cart is cheaper, when you know the RADs will only be used one place at a time. The RADX has a microphone type jack in it – to help the audio guy distinguish between the RADX and a standard CAT 5 data connection in the wall. The RADX mounts in a standard 1-gang US electrical box. It is available in white, ivory, or black, with a matched Decora™ plate cover included. Order model RADXW for white, RADXI for ivory, and RADXB for black. Important Note: The Neutrik EtherCON jack on the RADX is compatible with Neutrik's NE8MC and any standard RJ-45 plug. While EtherCON connectors accept CAT6 and CAT6A cabling, they do not work and are incompatible with all CAT6 plug and jack families. Use only CAT 5e compatible RJ-45 ends. If your RJ-45 says any form of CAT 6, or CAT6A, or CAT6^A, or CAT6A-ISO, or CAT 6 A-EIA – it is not compatible with the RADX or EtherCON.